With the release of the spectacular Iron Man 3 trailer this week, we got our first look, and our first listen, of Ben Kingsley's Mandarin. Some have commented on how weird he sounds, though I suspect that's just a reaction we'll have to any actor not using their natural voice in a post-Bane world. The dialogue is clearly editted together from various lines (which explains some of the odd syntex), and will undoubtably (hopefully) sound better in the film itself. 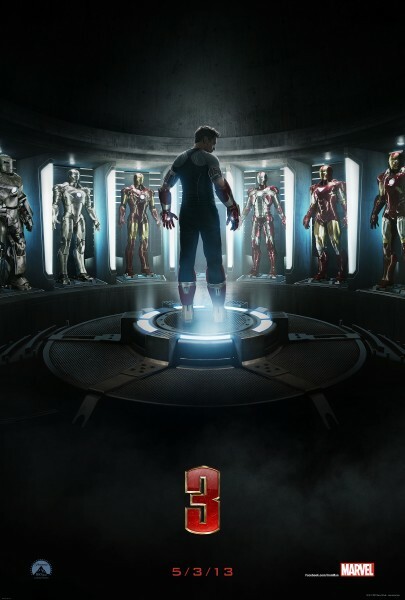 "Marvel Studios’ “Iron Man 3” pits brash-but-brilliant industrialist Tony Stark/Iron Man against an enemy whose reach knows no bounds. When Stark finds his personal world destroyed at his enemy's hands, he embarks on a harrowing quest to find those responsible. This journey, at every turn, will test his mettle. With his back against the wall, Stark is left to survive by his own devices, relying on his ingenuity and instincts to protect those closest to him. As he fights his way back, Stark discovers the answer to the question that has secretly haunted him: does the man make the suit or does the suit make the man?" Hit the jump for the Iron Man 3 teaser poster, SHIELD casting news, and quite a bit of X-Men/Wolverine updates, for a change of pace. - Clark Gregg officially has his first SHIELD co-star, in the form of Ming-Na Wen. The actress, known for voicing the Disney princess Mulan, and several years on ER, is no stranger to genre work, having most recently appeared in Stargate Universe, and Eureka. She will be playing agent Melinda May, who was previously announced as Althea Rice, a "hard-core soldier [with] crazy skills when it comes to weapons and being a pilot, but her experiences have left her very quiet and a little damaged." The character will also have the awesome nickname of "The Cavalry." - Deadline is reporting that Matthew Vaughn will not be returning to the director's chair of X-Men: Days of Futures Past. The studio is reportedly interested in bringing Bryan Singer back into the X-Men universe (as they have been with every X-Men film since X2), which might smooth the chances of Patrick Stewart and possibly other original X-Men actors returning to play their older selves. "Vaughn is going for a big sci-fi style thing with X-Men: Days of Future Past. It’s X-Men meets The Terminator. You’ve got robots, you’ve got time travel, you’ve got superheroes – it’s got everything in one film." Does this mean Sentinels will be coming back from the future in an attempt to stop the mutant blight before it starts? Will they follow whichever mutants finds their way back? Or could Millar just not think of another movie involving robots? - Under Millar's guidance, and if Stewart's comments prove true, there might be a greater attempt to try to unite the various X-Men films together, as reports are that Famke Janssen, AKA Jean Grey, has filmed a cameo for the upcoming Wolverine. As her appearance makes very, very little sense in a prequel (less sense then Stewart's cameo in X-Men Origins, and Hugh Jackman's in First Class), could this be a teaser for Days of Future's Past? Could this older-then-when-she-died Jean be a time traveler, searching for the right moment in history to contact Xavier and warn him of what is to come? Or at the very least, erase X-Men 3 from canon once and for all? The answer is no, if the very confusing comments from James Mangold are to be believed. He has stated that Wolverine will be set after the original trilogy of films, after everyone has died, the team disbanded, and Wolverine is on his own again. Except, he then immediantely said that this film does not take place in the continuity of the previous films, directly contradicting the previous statement. Or, at least making it pointless to say. While this may just be a simple example of cognitive dissonance, it makes for some very confusing press.